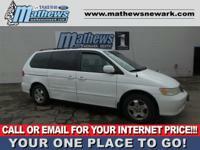 Odyssey EX, 4D Passenger Van, 3.5L V6 SOHC i-VTEC 24V, 6-Speed Automatic, FWD, Black. 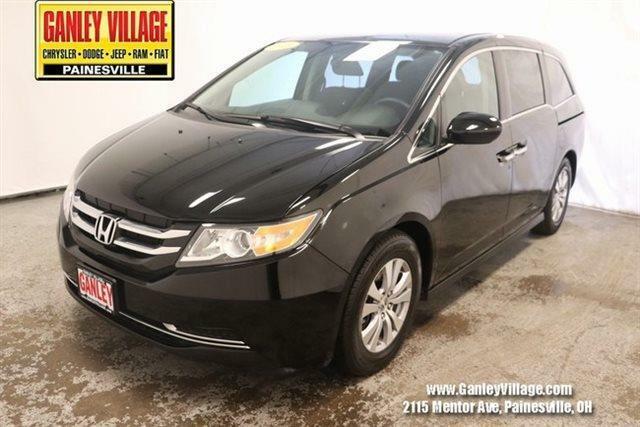 Honda Odyssey 2015 Black EX CARFAX One-Owner. Clean CARFAX. Reviews: * Agile handling; fuel-efficient V6; quiet cabin; configurable second-row seat; easy-to-fold third-row seat; top crash test scores. 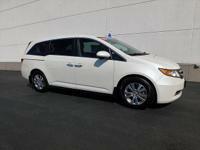 Source: Edmunds * The Honda Odyssey has a wide, low stance with a modern aerodynamic feel. Its fresh, angled lines, combined with updates to its front end, grille, and rear taillights result in a bold design. Take into consideration its great records for reliability and safety combined with fact that it is enjoyable and comfortable to drive, and this is one vehicle should not be missed. 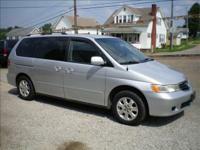 Depending on the trim level you select, it can seat up to 7 or 8 passengers. The third row seats are split, and each seat can fold flat into the floor. The outside seats in the second row can slide towards the walls, so that three child safety seats can fit next to one another. The Multi-Function 2nd-Row Center Seat, on EX trims and above, can either fold forward to become a center console or slide forward 5.5 inches to enable a child seat to be closer to the driver and front passenger. For extra cargo space, one or all of the second row seats can be removed as well. Powering the Odyssey is a 3.5L V6 engine, with 248 hp, which gets an EPA estimated 19 MPG City and 28 MPG hwy. The base Odyssey, comes standard with such items as a rearview camera, an AM FM CD Radio with 7 speakers and a color 8-inch interface screen, Bluetooth connectivity, and power front seats. Higher trims come with features like power sliding doors, LaneWatch camera system, navigation, 3-zone climate control, leather, and a power lift tailgate. The top-of-the-line Touring Elite trim gives you things like the amazing Honda DVD Ultrawide Rear Entertainment System, and a premium 12 speaker sound system with surround sound. The Touring Elite also gives you the convenience of the innovative HondaVac, which is a vacuum cleaner integr At Village Chrysler Dodge our sales department has one purpose: to exceed your expectations from test drive to delivery. Our professional sales team is committed to a no-pressure, high integrity approach to your ownership experience. We invite you to schedule a test drive or stop by our showroom to experience all that we have to offer.